Timber pallets & packaging are subject to plant health controls when crossing international borders, often resulting in costly and frustrating delays whilst checks are carried out. This is where ISPM15 comes in. It is now the internationally agreed standard for the treatment of all forms of packaging made from solid wood. It helps protect the world’s forests from disease and trade from costly delays. ISPM15 and the associated heat treatment certification is a world-wide passport for all wooden packaging. ISPM meaning – International Standard for Phytosanitary Measures. All types of wooden packaging for export must be heat treated. On completion of the heat treatment process, the wooden packaging is marked to show that the necessary treatment has taken place. This mark shows the Country of origin code – GB, Giffords Unique Registration Number – FC0370, The Heat Treatment Approved Measure Code – HT and finally the IPPC Logo. The heat treatment certification gives total traceability back to the heat treatment source. 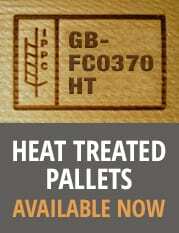 Giffords Recycling Limited is fully accredited and audited by the Forestry Commission to supply ISPM-15 Heat Treated Pallets.